What are Austin Talks? They're kinda like TED talks, but local and for everyone. We believe everyone has a story to share, and we want to hear your story. And you just might be inspired by someone else's story. This is a community event and all are welcome. Proceeds from donations will benefit Keep Austin Fed. We are grateful to Whole Foods for sponsoring and providing yummy treats for everyone! ﻿Watch videos from our last Austin Talks﻿! 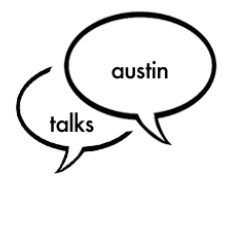 Want to speak at a future Austin Talks - let us know! We are hardwired to connect with others. We are not connected by our work, where we live, what possessions we have or do not have…we are connected by our humanness, our experiences and our feelings. As awareness of the inequality and inequity that our society faces daily increases, the desire to undo it rises. Amber Watts the founder of IMPAC Collective walks us through the need for anti-oppression work in today's society. The path of awakening is not for the timid. It is a compassionate journey for the inner warrior who never gives up. Join Jodi as she shares her journey of persistence, heart and dedication to a vision that is bigger than us all. Russell will be sharing with us the story behind Keep Austin Fed, and how, if you have an idea, you can make it a reality too! Anthony's brother died on the day of his birthday. From this great loss, a new passion was born. A passion that has become a gift that Anthony now shares with others. When Laura left her 10 year career in the non-profit sector to explore the possibilities of entrepreneurship, she knew she lacked any business experience or education. Yet, forming a tribe of heart-centered, wellness entrepreneurs was a dream that wouldn’t be ignored. Combining her experience as a psychotherapist, feminist and social activist, she launched a Coworking community in 2008 that would forever change her relationship to herself and her sense of possibility. When asked to describe the craziest day I've ever had on a new job, memories of insane dance gigs filled my brain. I thought about clients and students who were incredibly challenging, as well. But this particular day was the most crazy-wonderful, scary, intimidating, beautiful experience I've ever had. I started having grand mal seizures at age 30 and with 'a perfectly healthy physical brain' was given a diagnosis of Epilepsy and life time prescription for pharmaceutical drugs? Instead, I went back to study and discovered how real medicine is in our food. Video from our last Austin Talks. Thank you for making our first Austin Talks so amazing! We're told to love others as we love ourselves. But it turns out, a lot of people don't love themselves very much. Jonathan is looking to start a Self-Love Revolution, where we can begin to truly love ourselves, so that we can love others better and create a truly masterful life. In 2006, Melissa had the perfect life on paper. She just graduated with a 4.0 in her Master’s degree, was engaged to a wonderful man, and had recently moved into his beautiful home. Her life was full of possibilities, but she was miserable. For seemingly no good reason, Melissa slipped into a deep depression that lasted several months. However, being forced to confront her inner demons led to her life’s work: helping others through their own dark times and find meaning through their suffering. Mark Garza is the Founder and Executive Director of The Flatwater Foundation. Through his personal experience with his father's cancer diagnosis, he saw the importance of strong mental health and it's ability to help overcome life's challenges. The organization he created provides access to mental health support for families in need, coping with cancer. A child comes up to a brook and takes a running leap. The key to the child's success occurs right before the leap. Sandy Blackard, founder of Language of Listening®, explains how focusing on those key moments can change the way we see procrastination, avoidance and distraction forever. As social and political racial issues continue to develop in Austin, staying informed and educated on the current state is necessary in order make progress in our community. In 2000, Nelson was elected President of the Austin NAACP. Throughout his tenure, Nelson has appeared on local and national news to speak on issues ranging from police brutality to housing discrimination, and to this day, he continues to pioneer the work of the Civil Rights Movement. Motherhood can be both challenging and rewarding. For Dawn, being a mom has simultaneously brought her to her knees and offered her the gift of deep healing. Join her as she takes you through her journey of moving from an anxious woman with low self-esteem, to the grounded and self-confident one she is today. Want to talk at a future Austin Talks? Let us know - we want to hear your story! Or call us at 512.887.8807.